Source: National Weather Service in Gray, Maine. A reader wrote me recently saying that it seems windier in Concord than it did in her youth, and she wondered if climate change was affecting wind speeds. I mentioned this on Twitter to the National Weather Service’s account from Gray, Maine, which also covers most of New Hampshire. The NWS office has always been stupendous in terms of quick and useful response to any query we have and being on Twitter didn’t change that. They sent back the above chart within half an hour. 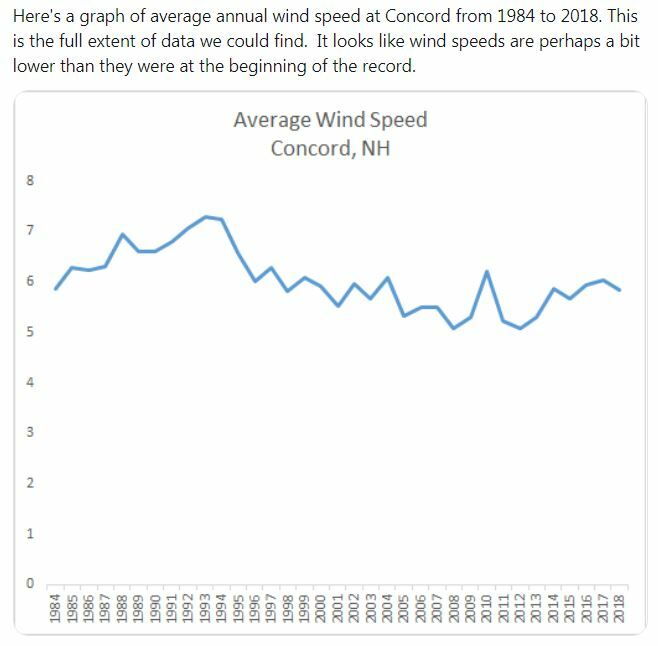 It seems to show that average wind speeds in Concord have, if anything, declined slightly over the past three decades. This doesn’t mean that my readers’ impression is wrong, however. “It seems windier than it used to” might, for example, reflect an increase in high-wind days during the course of the year that are balanced out by an increase in very calm days, producing an annual average that doesn’t change much. That is sort of what’s happening with precipitation: We’re seeing more extreme wet days and more extreme dry days, so that total precipitation over the year isn’t increasing much even though circumstances are changing rapidly. In other words, we have to end with the concluding sentence of every research paper ever written: More study is needed. Or tall buildings might channel the wind more in the places where people walk but where the NWS doesn’t record.